A case study of a high-speed seal test rotor shows how rotor dynamic analysis can be used to diagnose the source of high vibrations and evaluate a proposed remedy. Experimental results are compared with the synchronous and non-synchronous whirl response analysis of a double overhung, high-speed seal test rotor with ball bearings supported in 5.84- and 12.7-mm-long, un-centered squeeze-film oil dampers. Test performance with the original damper of length 5.84 mm was marginal. Non-synchronous whirling occurred at the overhung seal test disk and there was a high amplitude synchronous response near the drive spline above 32,000 rpm. 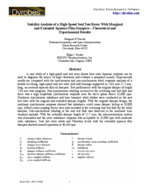 Nonlinear synchronous unbalance and time transient whirl studies were conducted on the seal test rotor with the original and extended damper lengths. With the original damper design, the nonlinear synchronous response showed that unbalance could cause damper lockup at 33,000 rpm. Alford cross-coupling forces were also included at the overhung seal test disk for the whirl analysis. Sub-synchronous whirling at the seal test disk was observed in the nonlinear time transient analysis. With the extended damper length of 12.7 mm, the sub-synchronous motion was eliminated and the rotor unbalance response was acceptable to 45,000 rpm with moderate rotor unbalance. Seal test rotor orbits and Vibration levels with the extended squeeze film dampers showed smooth operation to 40,444 rpm.